This weekend I was co-hosting a Peer Educator retreat for our health and wellness peer educators at Bradford Woods in Martinsville, IN. Bradford Woods is close to the Link Observatory, and I knew it would have better skies than my house in Noblesville, so I brought my camera along. 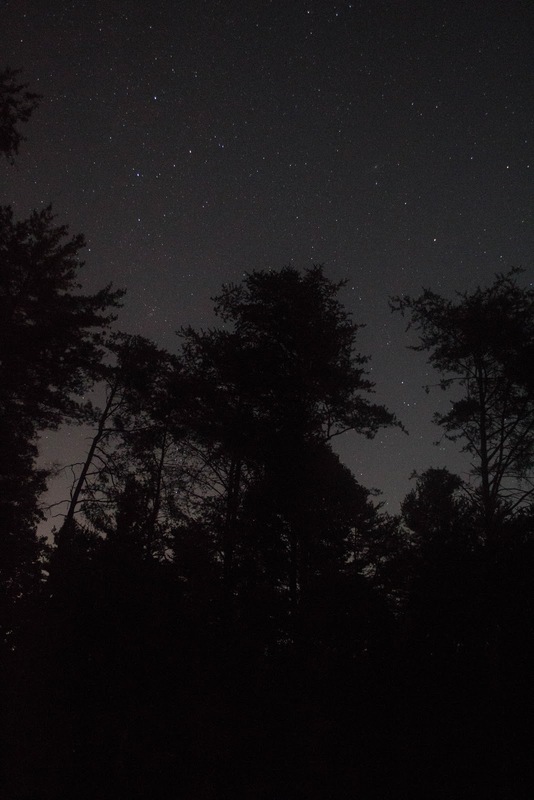 We had a campfire at night and I could see through the trees that the stars were crystal clear and that it was going to be a great night for stargazing. 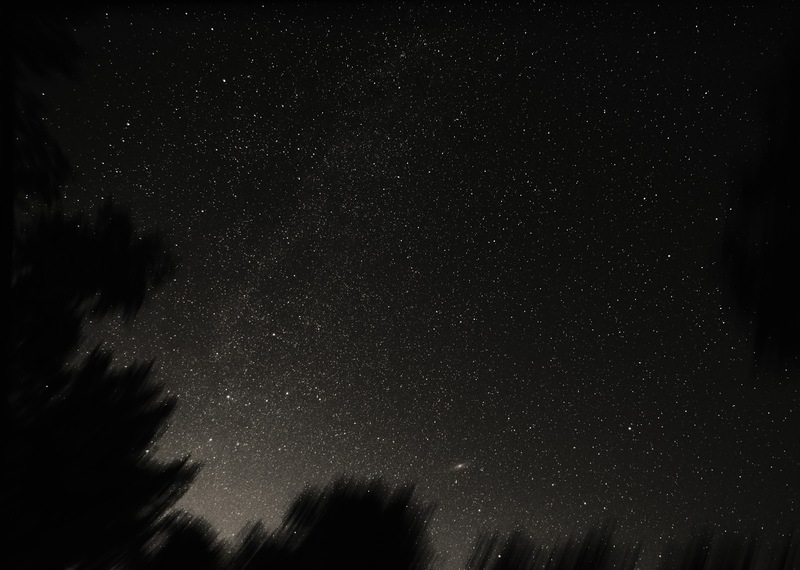 When I put the fire out and stepped out into a clearing, I could immediately see the faint veil of the Milky Way. 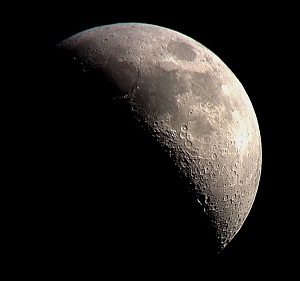 You know it's a great sky when you don't even recognize constellations because there are too many stars! The clearing I was standing in was amazing, it blocked out all of the parking lot lights, and all of the lights from the cabins in the park were blocked by the tall trees. 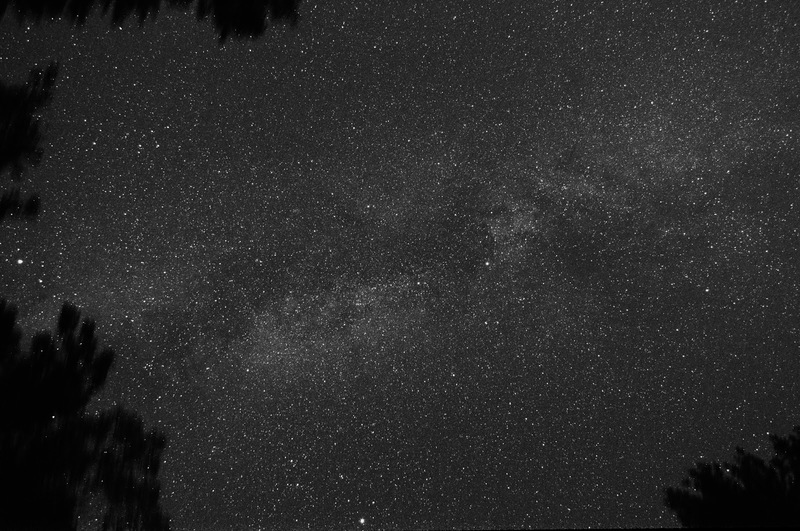 One drawback to the trees, however, is that I had no view of the horizon - and missed out on the brightest areas of the Milky Way. The region within the Summer Triangle is nice, and recognizable, but not the brightest bit by far. Facing the other direction, and at ISO 3200, I didn't get much nebulosity in the Milky Way, but I did catch our neighbor galaxy Andromeda - which at 18mm looks like a large blurry star. I'll end by saying it's a good sign when the trees in the foreground are actually black at night. I'm so used to seeing houses and orange trees in the neighborhood. Even at ISO 3200, these trees make true silhouettes against the night sky. Very cool!